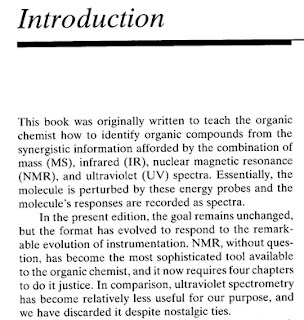 Introduction This book was originally written to teach the organic chemist how to identify organic compounds from the synergistic information afforded by the combination of mass (MS). infrared (IR), nuclear magnetic resonance (NMR). and ultraviolet (UV) spectra. Essentially, the molecule is perturbed by these energy probes and the molecule’s responses are recorded as spectra. In the present edition. the goal remains unchanged, but the format has evolved to respond to the remark able evolution of instrumentation. 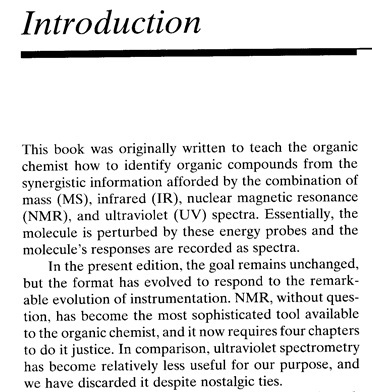 NMR, without ques tion, has become the most sophisticated tool available to the organic chemist, and it now requires four chapters to do it justice. In comparison, ultraviolet spectrometry has become relatively less useful for our purpose. and we have discarded it despite nostalgicties. Download buku kimia analitik Spectroscopy FTIR NMR MS di sini.